Kaya is a thick jam made by simmering coconut milk, sugar, eggs and pandan leaves together over a stovetop. Traditionally, it’s spread between two toasted slices of bread and a slab of butter. 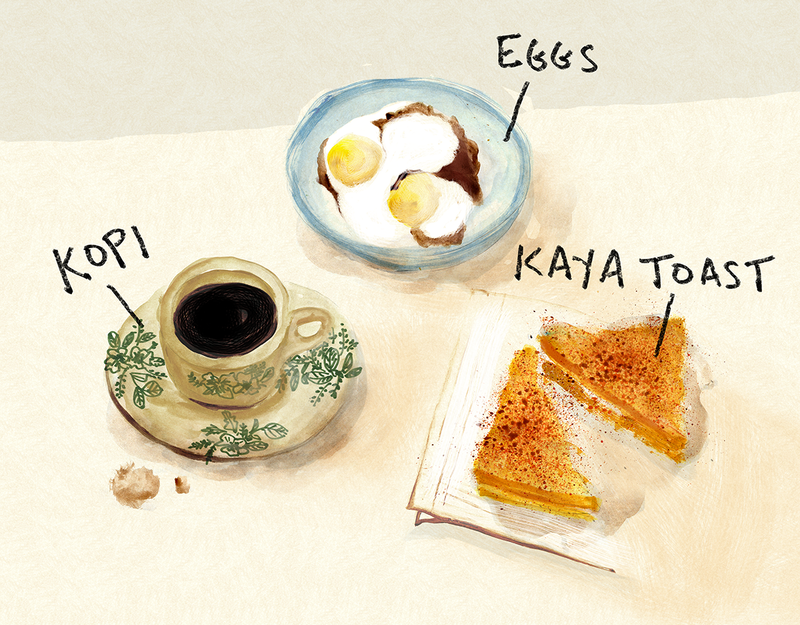 To enjoy it the Singaporean kopitiam way, serve with a couple of half-boiled eggs drizzled with soy sauce (similar to soft-boiled eggs, but runnier), and kopi (a dark rich coffee strained through a cloth sock filter and served with plenty of sweetened condensed milk). Place a double boiler over medium heat. While water is heating up, whisk together eggs and yolks in top part of double boiler until well combined. Gradually whisk in sugar. When smooth, pour in coconut milk. Add pandan leaves and place the bowl on the double boiler. Keep water at a gentle boil. Stir continuously for about 45 minutes. If lumps start to appear, lower heat and continue whisking. Around 45 minutes, the kaya will start to thicken. Remove pandan leaves and continue to cook and stir, until the kaya becomes thick and sticky. For the caramel color: To deepen the color of the kaya, you can add in caramel. In a non-stick pan, heat up 3-5 tablespoons of sugar or palm sugar over high heat. When melted and golden, stir in a tablespoon of water. Slowly add the caramel to the kaya and stir until it turns golden brown. Strain through a fine mesh strainer. Let cool and store in a jar in the fridge. To toast bread, heat up a skillet on high heat. Place slices on dry skillet and toast both sides. 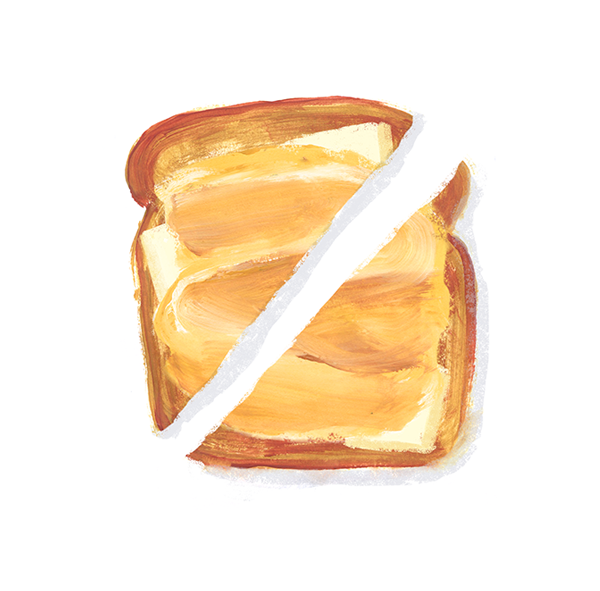 Spread on a thick layer of butter on both pieces of toast. (If butter is unsalted, sprinkle on a tiny pinch of salt.) Spread one side with a generous amount of kaya. Top with other slice of bread and cut in half diagonally. Make sure the eggs are at room temperature. Boil the water in a kettle and pour into a small pot. Gently lower the eggs into the boiled water. Cover and let the eggs sit in water for 8 minutes. Remove the eggs from water and let rest for 30 seconds or until cool enough to handle. Serve with a dash of soy sauce and a sprinkle of pepper.